OSWEGO – Thi Huynh, who plays Virginia O’Hanlon in the upcoming Oswego Players’ production of “Yes Virginia, There Is A Santa Claus,” welcomes theater-goers to the Frances Marion Brown Theater in the Oswego Civic Arts Center. 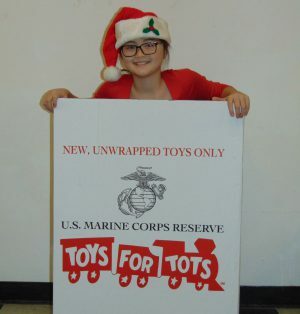 She is reminding them to bring a toy for Toys For Tots. This is the second year the Oswego Players have partnered with Toys For Tots to help area families have a brighter Christmas. “Yes Virginia, There Is A Santa Claus” will be presented on Dec. 2, 3, 9 and 10 at 8 p.m. and Dec. 4 and 11 at 2 p.m.
For tickets, call the Players’ box office at 343-5138.